We share our moments with those around us, but the experience of suspending is ultimately personal, and unique for each individual. Nobody can take your experiences away from you. We provide people with experiences. We believe in all levels of personal evolution. We support those that want to push their limits. 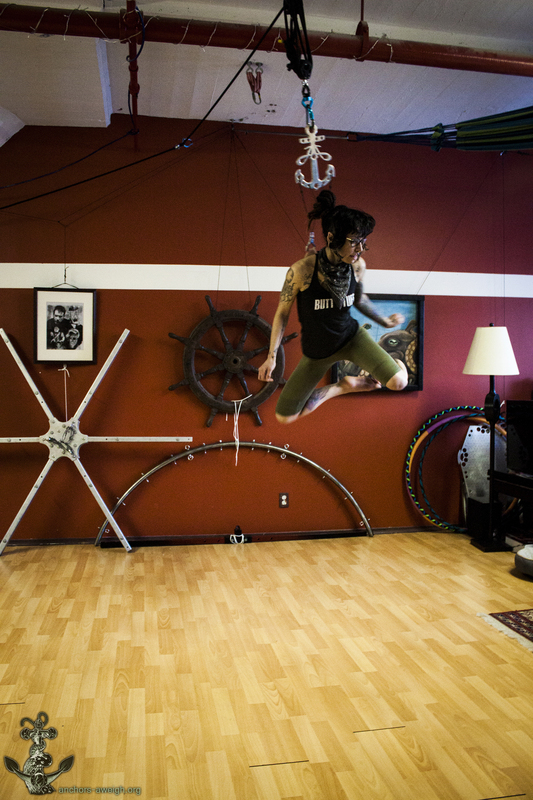 We are passionate about suspension as an artform. to return emotionally, mentally and spiritually enhanced. who work in a variety of mediums. in which to suspend and create new experiences. Providing our suspendees with a safe and positive experience comes first. Without the experience, the suspension lacks meaning. Body suspension is an artform to us. Unless it is requested that we do not document a suspension, or certain aspects of it, we make a point of capturing as much as possible on camera. Images tell stories that words often fail to convey. Members of Anchors Aweigh have different backgrounds in different industries. What brings us together is collaboration, with each other as well as other teams and/or artists. Working together, we can make unique art. We don't believe there is any one reason for suspending. Whether it's for personal reasons, spiritual in nature, or purely recreational, we respect all intentions, so long as they are not harmful to the suspendee, or others. The bottom line is, we are here in this life to help each other overcome limitations, and make progress on individual levels. We are forever learning, improving, and looking to elevate ourselves. Everybody has their own reasons, and motivations range from spiritual to recreational. Sometimes it is simply to sate one's curiosity. More often than not, the common denominator is some form of release; intense physical and emotional releases are frequent. Absolutely. But the pain goes away rather quickly as the endorphins and adrenaline being produced by your body kick in. It's not about the pain for us, but rather, the rewards of overcoming it; pain is a concept in your head, and the only thing stopping you from getting past it, is you. I'm interested. How can I get involved? You can attend a suspension event! We regularly have private sessions as well as some public ones. Private sessions are more intimate and involve small groups of people. 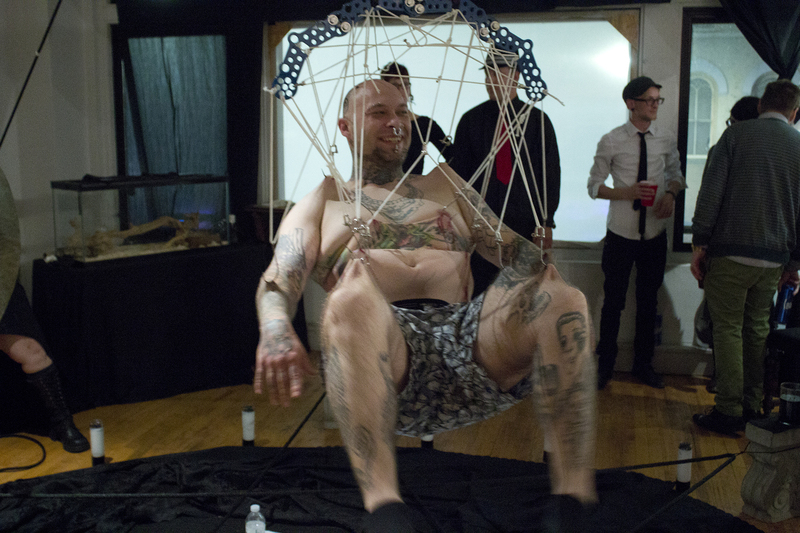 Public events often involve performances and live installations. Occasionally we will have public days that are not shows, where many people will suspend (both first timers and otherwise). Drop us a line using our contact form, and let's take it from there! I'm not anywhere near NYC, where can I find other teams? We travel a lot, and work with a lot of groups along the way. However, the best way to find a group is to ask somebody! (fill out our contact form). We would be glad to refer you to any reputable teams in your region that we are aware of. For general inquiries, you can email us directly at info@anchors-aweigh.org. 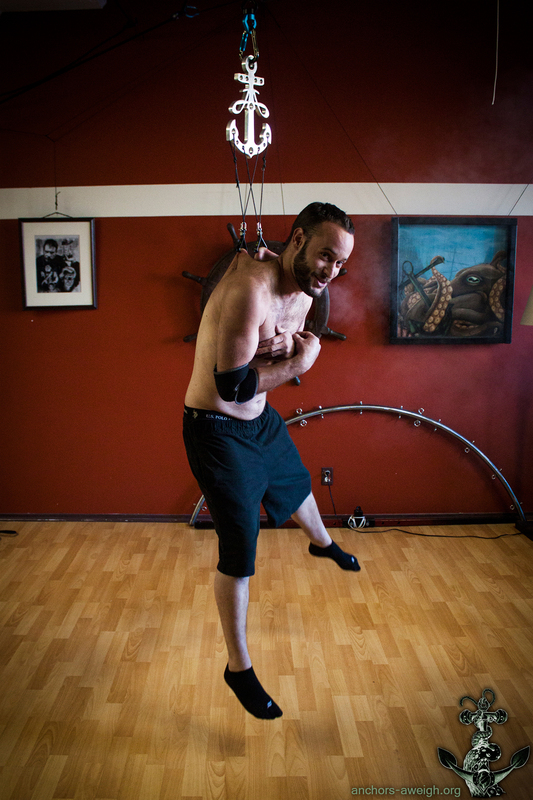 Are you interested in experiencing suspension first-hand with us? Click here to fill out our suspension sign-up form.